One of the most fundamental teachings of the Buddha is the Four Noble Truths. In fact the Four Noble Truths constitute the main theme within which all the Buddhist teachings can be understood to fit. First is the truth of suffering. Second is the origin or source of suffering. The third is the truth of the cessation of suffering. And the fourth is the truth of the spiritual path that leads to the cessation of suffering. We could think of the Four Noble Truths by way of the following analogy. The truth of suffering is like a disease. The truth of the origin or source of suffering is like identifying the causes of a disease. The truth of the cessation of suffering is analogous to the state of health or well-being when the disease has been cured. And the truth of the path that leads to the cessation of suffering is analogous to the medicine a person takes to become cured. In terms of daily spiritual practice, the truth of suffering concerns what we need to recognize to be the case. The truth of the origin of suffering concerns what we need to eliminate. The truth of the cessation of suffering concerns what we need to attain. And the truth of the path concerns what we need to rely upon in order to bring that about. Using the analogy of being sick with a disease, you have to recognize that you are sick to begin with and before you can take any steps towards health. This is the stage of recognition or understanding of what has already gone wrong. If a person lets months go by and doesn’t pay attention to the fact that he or she is not feeling very well, it could very well be that a disease is developing which is not being dealt with. That person may not be facing up to the fact of illness. However, if we have first recognized that we are sick and want to become healthy, to cure ourselves, we need to understand what the causes underlying that sickness are, because if we don’t identify them, we won’t get any better. And that’s analogous to the second truth, the truth of the source or origin of suffering, whereby you understand what it is you need to eliminate so that the cause does not give rise to the result, which is suffering. Now let’s imagine that there is a leak in the roof of this building. It starts raining and here we are watching the rain dripping through the roof onto the floor, drop by drop, so that the lovely floor here is being filled with a bigger and bigger puddle of water. We would probably rush to mop up the water with a towel. But if we just keep mopping up the water as it drips through the roof, we won’t really solve the problem, will we? If we don’t look up at the ceiling and find out where the water is coming from, the rain will continue to drip onto the floor and we will be continuously mopping it up. We have to recognize the source of the leak, don’t we? The point here is that if we want to be free from suffering, we have to accurately identify the source of suffering. I’ll give you another example. Suppose I was going to leave the room through that doorway and behind the curtain there was a large mountain lion that looks as if it could potentially attack and kill a human being, but it’s a stuffed animal. I don’t know that it’s stuffed and I don’t know that it’s there, but behind the curtain there’s a stuffed mountain lion and I’m going to go out through our past that curtain to leave the room. And because I don’t know that there’s anything there and quite cheerfully leave the room, humming a little song. And as soon as I get outside and see what’s there, I’m startled, because I see the seemingly ferocious beast about to pounce on me. As long as I don’t know it’s a stuffed mountain lion, I’d have the same kind of fear as if I’d met a live mountain lion. I’d have the same reaction in the immediate moment of seeing that stuffed animal. But if I knew that there was something harmless out there to begin with, I would just laugh - it wouldn’t hold the same kind of fear for me, because of my previous knowledge about its nature. And the more stuffed mountain lions that were put there to try and make it even more threatening to me would only increase my certainty and fearlessness about the fact that that there was nothing at all to be afraid of. I thought to myself, What’s this all about? It sort of made me chuckle that she wanted her picture taken in this way. So I turned to her and smiled. She immediately shouted, “Ahhh!” and jumped away from me. Her companion was standing there holding the camera with his mouth wide open. So obviously they mistook me for one of these wax figures. This story relates to the matter of recognition and identification that is associated with the first two of these four noble truths: the truth of suffering and the truth of the source of suffering. The whole point of identifying the truth of suffering as such is to become free of that suffering - through identifying it and then eliminating its causes. That’s the whole point of that level of practice. And with that kind of recognition and that kind of practice we can save ourselves an enormous amount of trouble. A lot of the problems and complications we face in life are quite meaningless, because they don’t need to happen in the first place. And so we can free ourselves from so much of that just by recognizing the truth of suffering for what it is and practicing in order to eliminate its causes. Now, the ordinary preliminary practices, the four contemplations that turn the mind, are to a great degree concerned with recognizing and identifying the truth of suffering and the truth of the source of suffering. These contemplations help us direct our mind away from activities that lead to suffering and toward activities that help us become free from suffering. The first contemplation which turns the mind away from concerns and activities that lead to suffering is reflection on this precious human birth that is endowed with every freedom and asset. It is difficult to get and can be easily destroyed, so now is the time to make it meaningful. The main point here is that this human birth provides us with the best opportunity to become free from suffering. But we have to recognize this and understand what we need to do to achieve that freedom. The cause for obtaining a precious human birth is abandoning negative activity and accumulating positive activity. Having achieved this precious human birth, what then are we free from? We are free from eight types of negative rebirths or negative states: being born as a hell being, as a hungry ghost, as an animal, as a barbarian, as a long living god, as a person with wrong views or ignorance, or being born at a time when Buddha’s teachings are not present. If the Buddha’s teachings are not present or obtainable, then one is unable to learn the practices that lead to liberation. And also, being born deaf or mute, one can’t understand the teachings. To be free means freedom from these eight states which entail extreme suffering, either in this life or future lives. The Buddha also said that the human being has power. In the Indian language the name for Buddha is Purusha. In English that means “powerful one, strong one, young one.” So we are all like precious jewels. We need to engender a joy of recognition that we have a precious body or opportunity which is like a wish-fulfilling jewel that is very difficult to obtain. In our minds we experience many kinds of suffering, not only from this life but from previous lives, with the likelihood of considerable future suffering. And the main cause of suffering, the second Noble Truth, is grasping. So if we have a method to overcome or change grasping, we are able to turn the mind away from grasping which causes the suffering. So how does grasping manifest in one’s mind? When we grasp to external objects, we have an idea or misconception that the happiness or the suffering that results from them are within the external objects. We hold the external objects to be the source of happiness. But this is not really the case. The object is not the source of happiness or suffering. Objects themselves are impermanent, a result of causes and conditions. The reality perceived by the grasping mind does not correspond to the reality of the objects as such. A powerful remedy for grasping or fixation on objects as the source of happiness and unhappiness is meditation on impermanence, the second contemplation that turns the mind. There are two types of impermanence, subtle and gross, which can be demonstrated in the following way. Let’s look at this cup I am holding now. Is the cup I’m holding now the same cup as the one I used earlier in the day? We tend to perceive it as the same cup, right? That’s the subtle grasping to permanence, the erroneous perception that the cup has inherent self nature. But it’s really not the same cup. It has been changing all the time, with the passage of time. That is subtle, moment-to-moment impermanence. An example of coarse grasping to permanence would be thinking, “This really is a cup. I like it. I want it.” And because of the typically greater intensity of coarse grasping there is usually greater suffering involved. As beginners, we can’t hope to eliminate all of the grasping to permanence straight away. That’s fine. The most important thing is to recognise the grasping. Simple recognition is very beneficial. As we continue to practise and also experience some understanding of emptiness, grasping can be pacified and eliminated. The third contemplation that turns the mind is that of examining the consequences of our actions. The Buddha taught that in general all phenomena are interdependent. Our physical body and the external world all arise in the own mind. One’s body, one’s mind, the external phenomena of the world are all interdependent with each other. Karma, or causes and conditions with the attendant consequences, accumulates because of this interdependence. For example, when you plant rice or some other crop in a field, there are many conditions and requirements to have a successful yield. First we need earth, then moisture, adequate warmth, air, and a seed. We also need the absence of creatures who might eat the seed. We need time for the crop to grow, and we need the farmer who plants the seed. If you gather all the causes together, the appropriate combination and context, you will obtain a positive result. Each of these different variables is interdependent with the others. If you don’t have earth, for example, the seed cannot be planted. If you don’t have air, the seed won’t grow. If there is no moisture, it won’t sprout. The fruition of the plant or flower is related to the causes; it is interdependent with the causes. Because of the causes, you get the fruit. As far as we are concerned, activities that are based on negative mental states or intentions will result in suffering. If one accumulates negative actions, the result will not be happiness - it will be suffering. If you plant corn, you will not get a bean as a result. Likewise, positive intentions and actions yield positive results. The fourth thought that turns the mind is samsaric suffering. What is samsara? Within samsara are the six realms of beings. The three lower realms include beings in the hell realms, hungry ghosts, and animals. Then we have what is called the three higher realms of humans, demi-gods, and gods. So when we talk about samsara, we are referring to these six realms of beings. However, the Buddha taught that all the six realms of beings are actually projections of one’s own mind. In the ultimate sense, the six realms of beings do not really exist. But because of the relative truth based on interdependence, they appear. How do the six realms of beings arise? They arise from the six poisons that are in our mind. And the six poisons within our own mind, through interdependence, manifest outwardly as the six realms. Contemplating the suffering in these realms helps turn our minds toward the Dharma that can free us from suffering. Let’s go back to the mountain lion behind the curtain. Suppose it weren’t a stuffed mountain lion but a live one behind the curtain. How would that change the picture? Imagine this: It’s not a stuffed animal, and there’s no point in pretending there’s no problem. There is! What do you do now? Run away? My point is that if there really were a mountain lion behind the curtain, and not a stuffed one, the way we dealt with the situation in the first example with the stuffed lion wouldn’t work this time. You would need to apply greater intelligence and a different way of dealing with that other situation. By analogy, further intelligence is what we develop when we understand and experience shunyata, emptiness, and the nature of mind. That level of practice is a step further than what we referred to in the first case. When you have developed the view of emptiness and the experience of the very nature of mind and have brought it to its consummation, then you can deal with the real mountain lion more easily, so to speak. You will be able to deal directly with the causes of suffering. They will hold no fear for you, no threat. You will be able to fearlessly proceed along the path and utilize the means that lead to cessation of suffering. Take the example of Milarepa. Fire couldn’t burn him, water couldn’t drown him. From his own perspective he was beyond birth and death. Why? Because fire, which is emptiness by its very nature, could not harm Milarepa who was emptiness himself. Emptiness couldn’t harm emptiness. The process of birth and the process of death all take place only within the context of the state of confusion. From the point of view of the ultimate nature of emptiness, birth and death are not inherently existent. So from the perspective of one who has realized emptiness, that individual’s perception is no longer involved in the process of birth and death. Thus we read accounts of Milarepa seeming to die in one area while someone else is receiving a teaching from him in another place. Or of Milarepa having already “died” and his corpse having been placed on the funeral pyre and set alight. When his disciple Rechungpa came late to the funeral, Milarepa was sitting up in the flames and singing a song of instruction to him. How can we account for these kinds of occurrences without understanding them from the point of view of the realization of emptiness? It can bee seen here that the truth of the cessation of suffering ties in very directly with realization of emptiness. In the ultimate sense, the truth of the cessation of suffering concerns the experience of the very nature of mind itself, the ultimate nature of mind. And the means to bring about that realization constitutes the fourth Noble Truth, which is the truth of the path. And so there’s a structure here. The Four Noble Truths are interrelated and tie in with one another. They are not separate from one another, but are intimately connected. This is why the Four Noble Truths are a foundation for Buddhist practice and liberation. New Year's Eve talk presented in Vancouver, 2003. 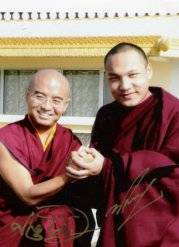 Arranged and submitted with the explicit permission of Venerable Mingyur Rinpoche and the Tergar Institute in Colorado (who hold copyrights) for Karma Lekshey Ling Institute by Gaby Hollmann. Photo courtesy of Hwayue.org in Taiwan.